A Renaissance Man in Hammer Pants… continued! Home/Country Line Dancing/A Renaissance Man in Hammer Pants… continued! Solomon Shacter (The Renaissance Man in Hammer Pants, in case there was any confusion), has kept himself so active, that his story had to be split into a two part feature! Dance is such an important part of Solomon‘s life that he can’t imagine anything that would cause him to stop dancing. Not even previous injuries that he has sustained from his active lifestyle consisting of running, weight lifting, yoga, auto and bike racing, and other sports. Fortunately, his injuries haven’t sidelined him for too long. He asserts that he will dance forever since dance has no age limit. He, like many others, began dance later in life and shows no sign of slowing down. Each year Solomon takes part in the ATOMIC Ballroom Showcase, where students pair with their teachers to perform a series of thematic routines in a classic theater. 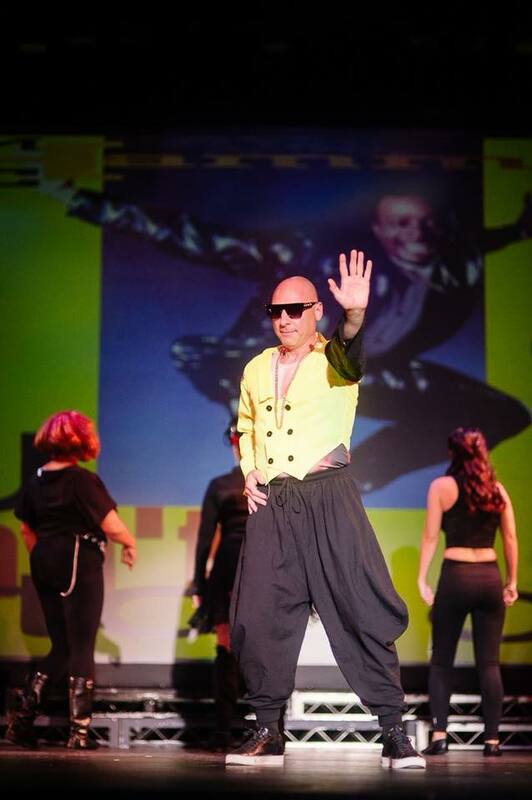 He has done everything from Lindy Hop and country routines to a Hip Hop number dressed as iconic rapper MC Hammer! As much as he has already tried, Solomon might still like to add West Coast Swing and Balboa dancing to his repertoire. Dancing appears often in The National Institute of Aging’s lists of activities that can help you stave off or combat osteoporosis, arthritis and even Alzheimer’s. The Institute has actually funded a study to gauge the effects of a regular schedule of dancing (“ballroom, swing, waltz, folk, and English country”) on both seniors’ physical abilities and their brain structure and function. A 2014 study found positive changes in mood for recreational dancers. Participants had higher energy levels and were less tense compared with competition dancers, who had stress levels similar to those of other competitive athletes. A 2011 study found that dancing as we age helps improve cognitive flexibility, known to decline even in high-functioning older adults. A July 2013 article titled, “The Cognitive Benefits of Movement Reduction: Evidence From Dance Marking” found that dancers can improve the ability to do complex moves by walking through them slowly and encoding the movement with a cue through ‘marking’. The findings, published in Psychological Science, a journal of the Association for Psychological Science, suggest that marking may alleviate the conflict between the cognitive and physical aspects of dance practice — allowing dancers to memorize and repeat steps more fluidly. Q. A guilty pleasure (perhaps a different type of dance, music or related to anything)? A. “Surprising people through quiet confidence. My guilty pleasure is remaining quiet about my skill sets, while others are boasting, then surprising the unsuspecting group with some well executed hip-hop moves or impressive salsa dancing, then return to the conversation as if nothing happened”. Q. Your favorite artist or music genre to dance to? Q. What are your other hobbies and interests? A. Easy. Anything and everything active that pushes my physical and mental limits. I organize and host tennis games, run marathons, attend yoga retreats, but also further my education in high-tech and relational calculus. Q. Your favorite saying, quote, or life lesson? A. Nothing is as bad as you think it is and nothing is as good as you think it is. Looked at over time, all change is good!